Are you traveling to Ukraine? I have written a guidebook for traveling in Ukraine hassle-free. It offers insiders tips and tricks on how to travel Ukraine in a smart way, so that you leave with nothing but good memories. Lviv is simply unrecognizable. I have been here multiple times before but this time I simply couldn’t believe I was still in Ukrainian Lviv, a city that 8 years ago although looking pretty, seemed to collapse any minute. You couldn’t walk the broken sidewalks, the buildings were a moment from collapsing and streets were not as clean as you wish they would. But now i is a completely new place! There are plenty of things to do in Lviv and it attracts both Ukrainians and foreigners who travel from as far as Canada to see the new frontier of Eastern Europe tourism and have a blast with Ukraine’s low prices. Within a few years’ span, the city turned into the hottest tourist spot in Ukraine. What a change! Why you need to book your flight to Lviv right now? Lviv is a city that has already made a reputation around Europe and a pretty good one! To be honest, it is already kind of too late to go to Lviv if you are a lover of off-the-beaten-path destinations. It is so packed, I literally had to push through the crowds of travelers and tourist groups to walk the Rynok square and its neighboring streets. Remember what Prague used to be a few years ago and what it is now? Give it a year or two, and Lviv will become as overcrowded as Prague is now. So, my advice, pack up your things and go before it is too late! Finding a flight to Lviv is not hard at all, you can fly directly to the Danylo Galutskyi airport, which is just 10 minutes drive from the city center. I always use Momondo as my search engine for best flight fairs. On my trip to Lviv, I have stayed in Vintage Boutique Hotel that is situated right by the Rynok square in the very heart of the city. It is a bit on the luxury side when it comes to pricing but the coziness and service you get in return is worth it. I loved the hotel from the very first step I took inside. First of all, the design is just what I like, it is all vintage and cozy, but at the same time not old. Secondly, there is a very nice wine bar downstairs with pleasant music and chill-out atmosphere, exactly what you need during the cold winter day. On top of that, the staff was very pleasant and I loved my room. It had windows towards the street, so you could glance over the busy commotion downstairs without any noise issues. If you are looking for something different, search Booking for a better option. Whatever you choose, try to book in advance, hotels in Lviv are feeling up quite fast. This is literally the highest point in the city and it is easily accessible by foot. There’s not much of the castle left after wars in middle ages, but you would be opened to an amazing view over the entire Lviv from there. Ploshcha Rynok is the very center and heart of the city of Lion aka Lviv. This is where the City Hall is situated, surrounded by lovely cafes on a beautiful paved square. This is the most touristy place in the city and you’ll easily stumble upon a tour agent who can offer you a variety of things to do in Lviv. 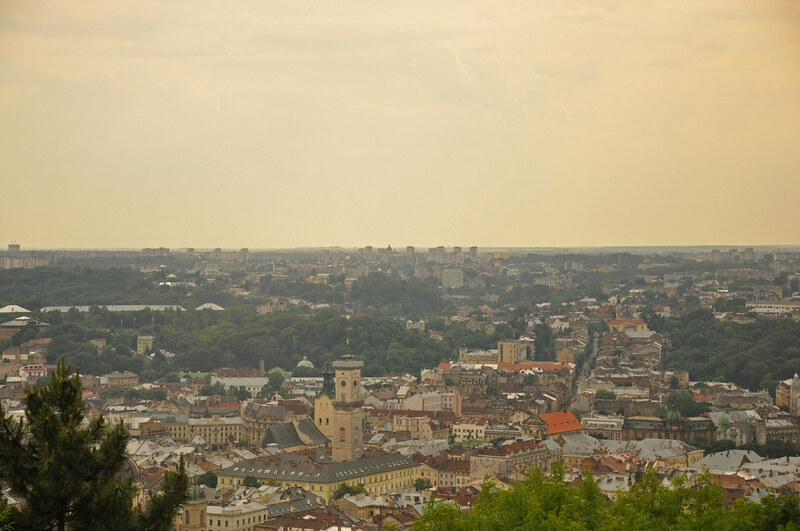 Besides that, you can also go up the City Hall tower and glance at Lviv from above. If you are not a fan of opera (same as me), you can get enough by just walking the Svobody Ave and seeing many of beautiful things around, such as the Lviv National Academic Theater of Opera and Ballet. Locals in Lviv often sit around on some of the benches playing chess and socializing. Lychakiv cemetery is one of a kind. It is simply a gorgeous park with beautiful tombs easily compared to Pere-Lachaise cemetery in Paris. It will take you some time to walk around the park where so many important people from Poland, Ukraine, and Russia have been buried. With time it became a legacy and a museum of a sort. The entrance to the cemetery is not free. However, the price is rather symbolic, 1$ per person. Done with all the landmarks and are looking for unusual things to do in Lviv? Visit the yard of lost toys! This is the weirdest place you will ever see. This backyard of an apartment building serves as an open-air museum-collector of the lost toys from all over the city. Both creepy and sweet at the same time. Lviv is known as a city with excellent brewing tradition. One of the most popular Lviv beer brands is called 1715, which literally states the year when Lviv started exporting beer outside the city. If you are not into museums, I suggest you just sit down in any of the numerous cafes and take a taste of fresh local beer. You will not be disappointed! The building situated on Saharova, 82 boasts having the biggest crossword puzzle in the world which is nearly 30 meters tall. The complication is that clues to this puzzle are hidden all over the important historical landmarks of Lviv and they are in the Cyrillic alphabet. However, the building is still fun to see, resembling the iconic dancing house in Prague. One of the postcards of Lviv is this Gothic church that is among the first things you see if you arrive at the main Railway Station. Get inside to see what the Greek Catholic church looks like. Stroll around one of the oldest streets in Lviv center – Virmenska street. Many of best cafes are situated here and you will get an inspiration for your Ukrainian meal. Part of the authentic experience is using the local public transportation. 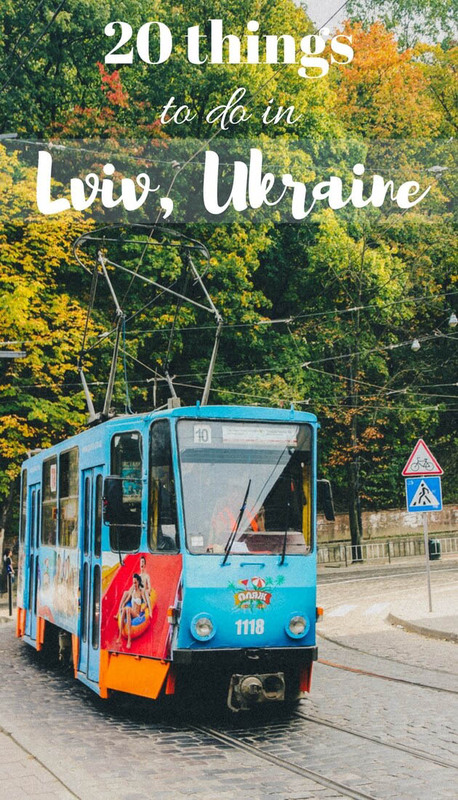 Hop on that typical Lviv tram (which will cost you almost nothing) and observe the city from a window. Having great foundation to becoming of interest to foreigners with its unique coffee and chocolate making, the city took one step further, transforming their cute cafes into playful scenes. If you haven’t noticed yet, Lviv loves everything thematic and theatrical. Most of the cafes will try to lure you in using some sort of theme or performance to differentiate themselves from the other competitors. And this is why Lviv is so fun! Lviv Handmade Manufacture store started up as something very specific to Lviv but eventually spread out as a chain throughout the entire country. A great store/cafe filled with everything chocolate always has plenty of visitors. You’ll see rivers of chocolate, edible souvenirs and chocolate chefs doing their magic. Try some treats, see how they are made and get some unique souvenirs with you! Believe it or not, Lviv is famous in Ukraine for its great coffee. And here, in the Coffee Mining Manufacture, you get the chance to experience the coffee roasting process. It is not only a coffee shop but a small museum, where you can go down the labyrinth and the real coffee mine. You’ll be convinced to put on a safety helmet (which is not really needed) and would be able to see barmen making coffee with help of a blowtorch! Besides the thematic farce, there is a lovely gift shop where you can buy little bags of coffee for all sorts of moods and days. This place became one of the most visited restaurants in Lviv. Though it has no name or any visible signs of the entrance (hint: it is situated on P. Rynok, 14), you’ll be able to find it following the lines of people trying to get in. Kryivka became famous for its password based entry – in order to be let in you need to know what to reply to saying “Slava Ukraini”, which should be followed by “Heroyam Slava” (this literally means: Glory to Ukraine – Glory to Heroes) and drink a shot of mead. Kryivka is styled up as an underground military base of 1920’s, the times of nationalistic movements in Ukraine. Here you can try all sorts of ‘military tapas’ which goes very well with shots of Ukrainian mead. Among other peculiar things, you can also order a meter of beer and a half-a-meter sausage. Drop by the colorful world of gingerbread. Rows and rows of colorful cookies with all sorts of creative ornaments would greet you at the entrance. Besides being a souvenir shop, this is also a place for getting a cup of coffee and a workshop space on making some treats yourself. “Gasova Lampa” restaurant is dedicated to the inventors of the gas lamp. The eatery also serves as a museum of all sorts of ancient illumination devices, giving out the atmosphere of chemical research, which supposedly happened here. As always, you are unlikely to leave the restaurants without a bottle or two of souvenir liquor. Are you ready for some extreme dining? Stop by modern art restaurant Salo, which pays tribute to traditional Ukrainian specialty – salo, which is basically just a gathered pig fat. This place takes things you can do with salo to the whole new level. Here you can try salo-sushi and salo in chocolate. Just look through their menu for inspiration and you will be tempted to at least visit and see the sculptures made of salo with your own eyes. This has become the landmark of Ukraine – tasty Ukrainian chocolate, made in one of the biggest European confectionary – Roshen. You can find one of their official shops in Lviv. One of the special features of the store that adds to its cuteness are the moving doll figures representing the city life and masters of chocolate. Another great thematic cafe in Lviv is disguised as a Post Office. Decorated with multiple postcards, old letters, and postage stamps, it gives that great retro style. You can even create a postcard of your own! Stop by for a cup of coffee and a snack. Themed cafe Masoch became popular all over Ukraine for its exceptional poignant experience. The cafe is named after infamous Leopold Ritter von Sacher-Masoch who was born in Lviv and made his sexual preferences be known as masochism. Apart from the pornographic menu, here the waitresses will whip and handcuff you for free upon request! Do not pass on the opportunity to try the bull’s testicles and the best fondue in town. No worries, the price is just another trick to get you in! With a proper discount card which you can get in any other !Fest restaurant (Kryyivka or Lviv Chocolate Manufacture, for example) you get exactly 90% discount. Again, you won’t be able to find the entrance door with a name on it, you have to know where to go. And believe me, you will be confused every step of the way! The entrance door will lead you to the old apartment where you’ll have to chat to the apartment “tenant”, who’ll tell you that the restaurant is not here. But after a minute of chatting, you’ll be able to get in and dive into the atmosphere of secretive mason society. The only problem is that many of these restaurants in Lviv became so popular that now you can hardly get in without standing in line. But there is a simple solution. Joining one of the Gourmet Tours offered by Just Lviv It, who is the owners of most of the thematic cafes in Lviv, you get the advantage of skipping the lines and getting a story behind every establishment. Besides the gourmet tours, Just Lviv It also offers plenty of other variations to any taste: romantic tours, rooftop and underground tours, mystical tours, historical tours, coffee tours and what not. The great thing about them is that they are often made in a thematic and funny role-play that is engaging to visitors. This is not a nearly complete list of all things to do in Lviv, which is constantly developing and reinventing itself. Lviv is not some rustic off the beaten path place anymore. It looks like a solid European city with the ambition to be number one tourist spot in Ukraine and probably, the region. The next time I visit it might be something completely different, but one thing for sure – it will be an unforgettable experience. Disclosure: Some of the links in the post are affiliate links that help keeping this blog alive. Clicking them will let you buy products and I might earn a small commission from that with no extra cost to you. Thank you for supporting Travel Monkey blog. Dear California, you brought me back to life! previous article: SO YOU WANT TO MOVE TO DENMARK? Thanks, Talia! It sounds like your mom knows what she’s talking about..haha! I am sure you won’t regret going to Lviv. Thank you for providing me with some fab ideas. The garden of lost toys sounds creepy but i want to visit! Haha, it is a bit creepy, but very unusual.